The Mom Chef is a food blogger who takes on "the challenge of making magazine recipes at home." She's exactly like me. Except she writes better. And cooks better. Fine, I'm not worthy, I shouldn't really even mention her name in vain. Anyway, one of her recent posts discussed a Food Network recipe for chicken burgers that sounded delicious. Well, not literally sounded; most posts are silent text (but I digress ...). Either way, it made me go defrost some ground turkey (since that's what was in the freezer) just to try it out. The kosher deli counter at my local Try-n-Save sells Chinese Sesame Slaw. 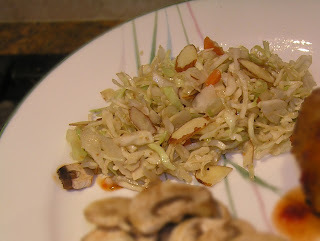 A concoction of Asian-ish ingredients, it is a nice alternative to the standard cole slaw (Deli Guy literally said, "Try it, you'll like it!"). However, oil seems to be a major ingredient, practically oozing out of the sealed plastic container. With help from the intertubes, I managed to create somewhat of a clone, but with less ooze oil. It can be made up to a day in advance, easily doubled, and travels well to a picnic, barbecue or Hadassah paid-up meeting. Use almonds of the slivered persuasion to mimic the deli-counter version, otherwise use sliced or omit them entirely without causing any severe tire damage. I was pulling out a bag o'lettuce for salad with dinner, when I noticed a container of baby spinach languishing in the back of the veggie bin. Despite a long-past "best by" date, the spinach was in remarkably good shape. But, thinking that my luck with greens might run out in a few days, it needed to be used up faster than I could possibly do by sneaking adding it into the salad. Quick, Batman! To the "recipes that should be tried some day" folder! And what should I find there, but a soup (the recipe, really, soup in a folder would be really messy) that needed virtually the exact amount of baby spinach leaves that happen to be languishing in the back of the veggie bin. Woo-hoo! I like chicken fried rice and chicken chimichangas as much as the next person. But tonight I needed a change of pace. So reaching into my folder of "recipes that should be tried some day," out popped a recipe turkey croquette. With only a few changes, it became a chicken recipe! If by some miracle you happen to have leftover mashed potatoes lying around, this recipe comes together reasonably quickly. But the really great thing about these croquettes is that they reheat beautifully (at 325F for 10-15 minutes), so they can be made in advance for a future dinner or (if made into 1-inch balls) a party appetizer. As I mentioned back in the Rocket Rolls post, I joined Project Pastry Queen, where a different recipe from the Pastry Queen cookbook is selected and then baked by members each week. This week is Wild Card Week, where members can bake any recipe previously chosen. I wanted to make Sugar Saucers back in December, but reality got in the way. In fact, I thought I only missed couple weeks since the Rocket Rolls, but it turned out to be a whole month! Eeeek! So I'm grateful to have this second chance. As my wild card I selected Sugar Saucer cookies. I like Foodie Bride's twist of adding almond extract into the cookie dough, then baking as mini tarts in order to "maybe" serve with a scoop of ice cream. But instead of chopping up almonds, because I was lazy I prettily sprinkled sliced almonds on top. They were similar to Chinese-style almond cookies, except much more delicate and buttery.